PRIESTS who heard confessions on Divine Mercy Sunday said the number of people approaching the Sacrament of Penance was unexpectedly high. Queues for confession at the Sandgate Brighton parish were almost three times as long during their Divine Mercy Sunday celebrations. One parishioner said the queue was three rows long and lasted almost two hours. Oratorian Father Adrian Sharp said he was inside the confessional for two hours and 20 minutes while fellow Oratoryian Father Scot Armstrong led the exposition of the Blessed Sacrament. “It was surprising,” Fr Sharp said. Catholics who take part in Divine Mercy Sunday celebrations, which is observed on the Second Sunday of Easter, can obtain a plenary indulgence under the usual conditions, including confession, reception of the Eucharist and praying for the intentions of the pope. St Mary’s South Brisbane parish priest Capuchin Father Lam Vu said many people who approached the confessional were taking advantage of the plenary indulgence attached to Divine Mercy Sunday. Fr Vu said he heard several confessions from people who had not been to the Sacrament of Penance for some time. “It’s a very good experience when people who haven’t been to confession for a while use this feast day to be forgiven of their sins,” he said. As well as a plenary indulgence, Christ promised Catholics who received Communion on Divine Mercy Sunday forgiveness of all their sins. Bray Park parishioner Eileen Hearn has organised Divine Mercy Sunday celebrations at her parish for the past 15 years. Every year parishioners are invited to a Eucharistic procession around the church on the feast day, as well as Mass at 3pm. The confessional is open during the entire celebrations, and this year three priests offered the sacrament. “The priests tell me they hear the best confessions on Divine Mercy Sunday,” Mrs Hearn said. “All your sins of your past life are forgiven on Divine Mercy Sunday. Mrs Hearn said the desire to help others inspired her to organise the events for the feast day. “It’s just to help people, as people need as much help as they can get these days,” she said. Divine Mercy Sunday became an official feast day for the Catholic Church on April 30, 2000, the same day Pope John Paul II canonised St Faustina Kowalska, who recorded conversations she had with Christ the Divine Mercy. St Faustina’s diary entries about the Divine Mercy have become one of the most revered devotions in the Catholic Church in Poland. Bowen Hills parish priest Fr Andrzej Kołaczkowski, who is originally from Poland, was 14 years old and on a pilgrimage to Czestochowa when he first heard about Divine Mercy Sunday. He said as a teenager he was struck by the concept of God’s mercy in the Mass and confession. “You grow up hearing about justice … but hearing about God’s mercy, it was a breath of fresh air,” Fr Kołaczkowski said. On April 23, the Bowen Hills parish honoured the Divine Mercy feast day with all-night adoration, confession, the Divine Mercy Chaplet and Mass. St Faustina Kowalska’s relics were also displayed and venerated. “There was a big line for adoration of St Faustina’s relics,” Fr Kołaczkowski said. He said a large number of people who attended the parish celebrations were not just Polish Catholics, indicating the devotion was relevant to all people. 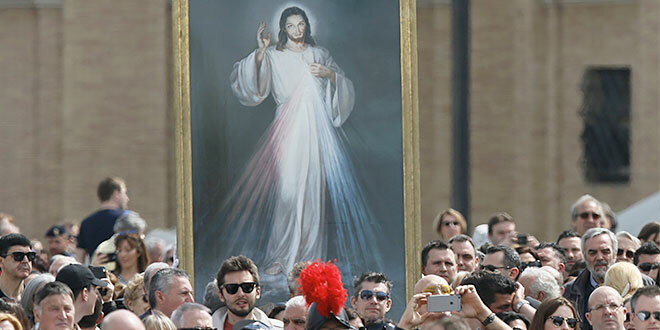 “Divine Mercy is relevant to everyone’s life,” Fr Kołaczkowski said. “We realise that it’s not the judgement but the mercy of God that gives us forgiveness.